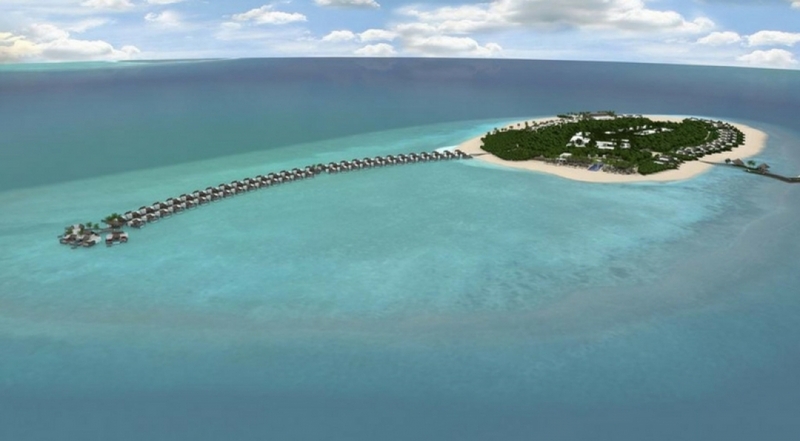 Another luxury resort will soon be unveiled for your pleasure amidst the splendid islands of the Maldives with 120 villas designed to offer you an ultimate luxury holiday. You can choose from 60 beach villas and 60 over water villas that has 1 bedroom, 2 bedrooms and 3bedrooms depending on your need featuring modern amenities such as two flat screen TV’s, outdoor “under the stars shower”, bathtub for two, refreshed minibar and twice twice-daily made service. You can opt-in to relax in their fully fledged Spa with specialty therapies offered by Thai, Balinese and Indonesian massage therapists or head over to the Gym to keep yourself fit with the availability of personal trainers on request. There are four restaurants that offer the best of culinary experiences with the main restaurant Aqua offering indoor and outdoor dining options, South American flavours at the South American restaurant, delicious Asian cuisine at the Asian restaurant and Beach Grill restaurant overlooking the sparkling lagoon. You can take on an excursion to explore the Coral reef and more than 1000 fish species at the diving centre and engage in land based and water based sports. Emerald Maldives Resort and Spa is an all-inclusive resort in the beautiful Maldives for you and your loved ones.